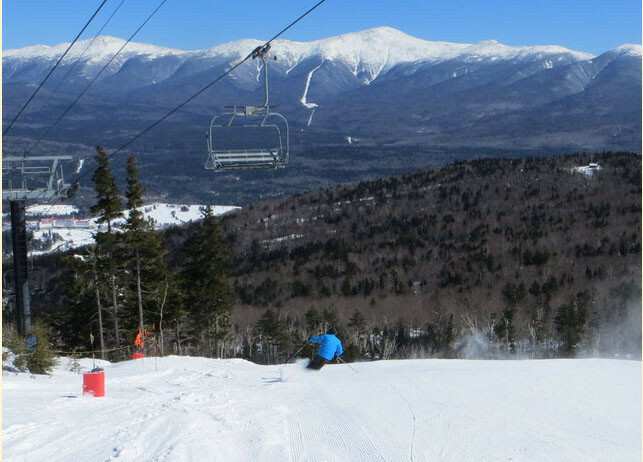 As New Hampshire’s largest ski area, Bretton Woods offers skiers and riders long groomed trails combined with spectacular views of Mount Washington and the Presidential Range. The ski resort is consistently ranked as one of the best resorts in the east. The resort is home to an extensive trail system connected by updated chairlifts. The ski area also has an excellent snow-making system covering almost all of their 464 acres of skiable terrain. Bretton Woods features 102 trails and glades serviced by 10 lifts spread across 464 acres of skier and rider accessible terrain. For alpine skiers and snowboarders, it offers a vertical drop of 1,500 feet and an annual snowfall of 200+ inches with 92% snowmaking ability. As one of the only resorts to provide lift serviced Nordic terrain, Bretton Woods hosts 103 km of Nordic terrain with increased accessibility to high-country terrain on Mount Stickney. Freestyle skiers and snowboarders will find four progressive terrain parks to practice their progressions. Centrally located within a short distance to more than a dozen local attractions and nine restaurants. Dining varies from four-course, elegant dining to casual pubs. Eighteen thousand acres of National Forest surround the 1,200 acre resort and a tax-free outlet shopping is thirty minutes away. Also available: The Red Carpet Ski and Snowboard School and season-long programs, like Team Bode, named for the resort's Director of Skiing and World Champion skier Bode Miller.